As is the case with any building material, metal roofing must be properly installed in order to be successful. Homeowners are encouraged to fully investigate both the metal roofing materials they are considering and the contractors they are considering for installing those materials. This investigation should include looking at past jobs and talking with past customers. If the manufacturer and/or the contractor are unwilling or unable to share information with you concerning proper installation procedures, it might be wise to find different suppliers. Check also for proper insurances and licenses, and make sure the crew that will be installing your roof is the same crew that was on the reference jobs you visited. View a complete Contractor checklist here. Due to their very low weight, many metal roofs can be installed over existing roofing materials. This is particularly the case when going over old composition shingles. Additionally, the formation of many of the heavily profiled shake and tile profiles of metal roofing can even permit installation over wood shingles or wood shakes. Before deciding to install over an existing roof, the manufacturer or an experienced contractor must be consulted, as weight is not the only issue. In many cases, building codes prohibit more than two layers of roofing, although building inspectors have been known to waive that restriction for metal roof layover installations. If there is an existing weight problem with the structure or if there is question as to the integrity of the structure or roof decking, those issues must be addressed before installing over the existing shingles. In some cases, particularly with wood shingles and shakes, the old roofing must be removed from the edge perimeter of the roof and even the lumber can be removed and replaced with fresh lumber before proceeding with the roof installation. Metal can also sometimes be installed over existing slate and asbestos slate roofs though, again, the manufacturer or an experienced contractor should be consulted. 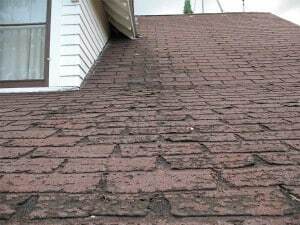 Existing tile roofs and, in most cases, existing metal roofs, need to be removed prior to installation of the new roof.